Service is an important aspect in my professional and personal life. Professionally, I engaged in both intramural and extramural service by participating on search committees, acting as a peer reviewer for academic journals, and participating in professional societies. Personally, community engagement is extremely important to me. I am currently the Vice Chair of the Williston Conservation Commission. This volunteer role allows me lend my expertise to my community in a meaningful way. I am also a competitive cyclist, focusing on the disciplines of cross-country mountain biking and cyclocross. In addition to being a member of a race team, I am a Trek Women’s Advocate. 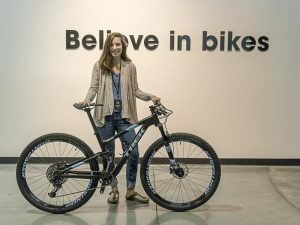 Through that role, I work with Trek Bicycles to get more women engaged in the sport of cycling.